Last week, I had gorgeous, sweet, fresh pineapple on hand, and I decided it would be absolutely divine folded into a simple no-bake bake dessert. A crunchy graham crust is layered with a cloud-like, pineapple-infused sweet cream cheese filling and finished with a dollop of fluffy whipped topping to create a five-star dessert in less than 10 minutes! 1. In a medium bowl, stir together the graham cracker crumbs, sugar and melted butter. Evenly divide the crumbs between your individual serving dishes and press into the bottoms of the dishes to form a crust layer. 2. In a large bowl, with an electric mixer, beat the cream cheese and sugar on medium-high speed until smooth and creamy, about 3 minutes. Add in pineapple and vanilla and mix to combine, scraping down the sides of the bowl as needed. Using a rubber spatula, fold in the whipped cream until well combined. 3. Evenly pipe or spoon the filling into prepared individual serving dishes. Cover with plastic wrap and refrigerate for at least 3 hours before serving. 4. 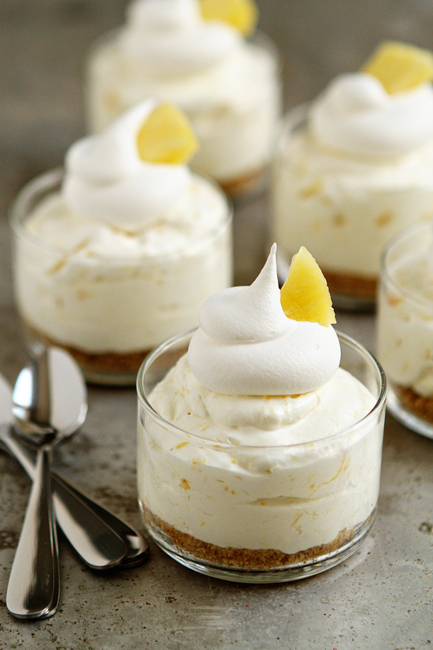 If desired, garnish with additional whipped cream and fresh pineapple.